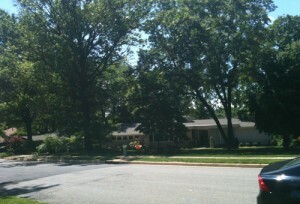 Hook Road in Reston is a lovely tree-lined street backing up to the Hidden Creek Country Club golf course. Built in the 1960s, the Hook Road in Reston, VA is the perfect spot for anyone who wants to be able to walk to everything. Situated in the Lake Anne area of North Reston, Hook Road is a horseshoe off of Fairway Drive. And, as you have probably guessed, the Hidden Creek Country Club golf course backs it. That means the view from your back deck is an expanse of well maintained green space. The Hook Road homes are classic contemporary style, single-family homes, most with three or four bedrooms, and all with a great view of the golf course. The homes are typically two story, and many have brick exteriors. The homes line only one side of the street. The inner space of the horseshoe houses a baseball diamond for little league, RA tennis courts, and a basketball court that provide outside entertainment all summer. And there is plenty of room among that green space to lay out a blanket for a family picnic. 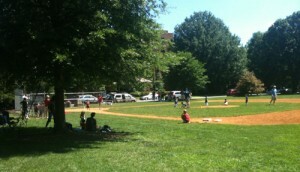 The baseball diamond at Hook Road and Fairway is a favorite spot for Reston little league games. Hook Road is a quick walk to Lake Anne Village Center, and just a little further to Reston Town Center. Lake Anne Elementary School is across the street, making morning walks to school a breeze. This charming, quiet (well, except for little league games) neighborhood is the perfect location for any family that wants to be in the middle of everything, but still live in an established neighborhood.